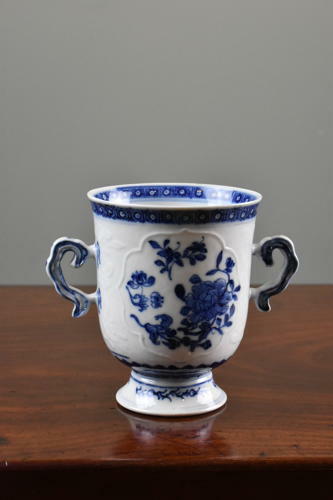 A fine quality, Qianlong period, Chinese export blue and white double-handled cup. The cup, with beautiful floral motifs and relief decoration to both sides, is raised on a pedestal base and retains the two original protruding handles. Circa 1760. Condition: There is a minor and almost imperceptible restoration to the rim.